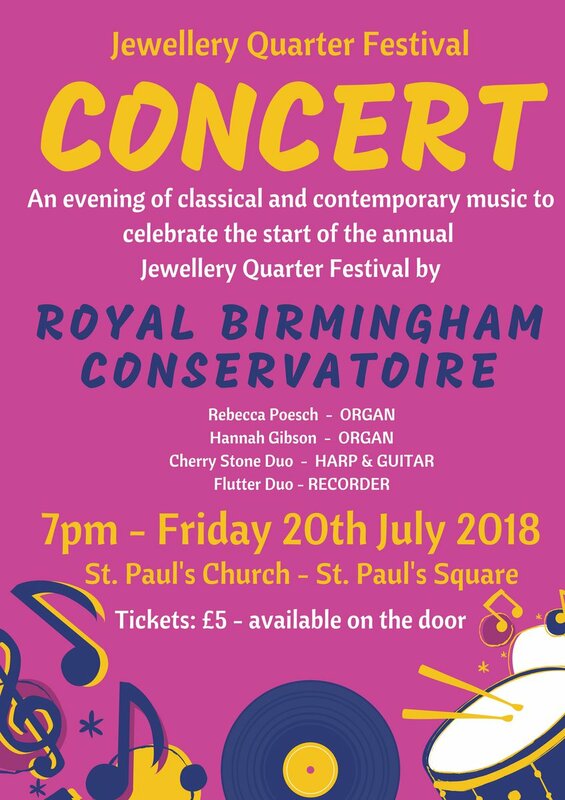 An evening of classical and contemporary music to celebrate the start of the annual Jewellery Quarter Festival, given by students from Royal Birmingham Conservatoire. We invite you to join us for this peaceful and contemplative service of music and readings to celebrate the Jewellery Quarter Festival. Great choral masterpieces by Dvorak and Mendelssohn can be heard in Birmingham on June 30th. One of the region’s best amateur choirs, Birmingham Choral Union, will be performing Dvorak's Mass in D and Mendelssohn's German Liturgy in a concert which also includes Mendelssohn’s Prelude and Fugue in C minor for the organ. Birmingham Choral Union’s conductor, Colin Baines, is one of the most well-respected figures in music-making in the Midlands and the choir will be accompanied by talented organist Darren Hogg. Mendelssohn has long been a favourite of Birmingham audiences. He travelled to England many times in the 1830s and 40s and conducted many of his own works at the Town Hall. Birmingham Choral Union perform Dvorak and Mendelssohn at St. Paul’s Church, St. Paul’s Square, Birmingham, B3 1QZ on June 30th at 7.30pm. Please ring 0121 550 1107 for more information. The church will be used as a polling station for the Jewellery Quarter, and will be open from 7.00am - 11.00pm. A magical Christmas concert, starting with Tchaikovsky's enchanting score from Sleeping Beauty and in the second half all your festive favourites - from Sleigh Ride to much-loved carols to sing along to! Aimed at the heart of Christmas, these atmospheric concerts have become a popular tradition in Birmingham and London, which this year we extend to Hereford, Leicester and Wolverhampton. A seamless stream of music brings old favourites, stunning new music and hidden gems, all interspersed with readings that capture the meaning – and humour – of the season. You are invited to bring your own mulled wine and mince pies for the interval. This concert will finish at approximately 10pm. Buy more – and save more! For details of Ex Cathedra's FAMILY FRIENDLY matinee performance, click HERE. An evening of enchanting classics from the Birmingham Gay Symphony Orchestra. Rossini's Italian Girl is ten minutes of musical sunshine and Schubert's Unfinished Symphony is a small but perfectly formed gem. But first Mozart's Magic Flute sets the scene, and his Flute Concerto performed by Christopher Green is going to be... well... magical! Birmingham-based Writers Without Borders is a local writers group who will be performing FREE of charge at St Paul's Church as part of our ongoing 1240 Arts Series. Come and be uplifted on Saturday 17th October at 12.40pm! Edward Elgar – Sea Slumber Song. Birmingham Festival Choral Society, Kevin Gill – organ, Jeanie Larkin – mezzo-soprano, Patrick Larley – conductor. X-Factor stars and operatic multi-platinum selling vocal quartet G4 embark on a "Christmas By Candlelight" UK tour this festive season. With a series of eight shows in beautiful churches and cathedrals nationwide, these intimate shows see Jonathan, Ben, Mike and Nick share the songs from their eagerly-awaited new album, "G4 Christmas" including Christmas classics and carols, all delivered up-close and personal in some of the UK's most iconic historic venues. Come and let G4's unique sound transport you into the festive spirit in a way you won't have imagined possible. A French extravaganza with a Hungarian twist: melodious Fauré, dramatic Langlais, timeless Duruflé and organic Kodály. A fabulous programme of choral and organ music to enjoy in the splendid acoustic of St Paul's Church, in the heart of Birmingham's popular Jewellery Quarter. St Paul's hosts a site specific art exhibition.